[See NewsBusters for more.] The journalists at NBC News couldn’t let the funeral service of George H.W. Bush go by without using the occasion to offer some nasty comments about other Republicans. 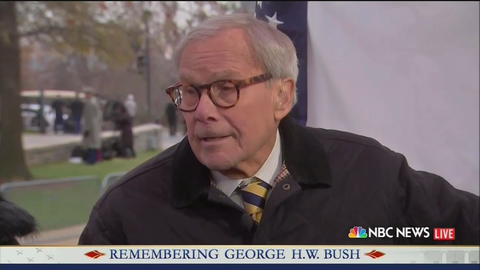 Former NBC Nightly News anchor Tom Brokaw pointlessly recounted, yet again, that Barbara Bush didn’t like Texas Governor Rick Perry.